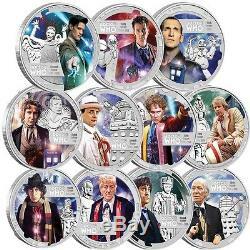 DOCTOR WHO FOB SET 50th ANNIVERSARY PURE SILVER COINS with free empty TARDIS. Officially licensed from the BBC, to commemorate the record-breaking 50th anniversary of the iconic tv show, Doctor Who. Started in 1963, the show has grown to be bigger than ever, and in celebration of that, the Doctor Who 50th Anniversary Fob set was struck for the event. Its a spectacular release combining the mythos of this cult series, with the design and packaging skills of one of the worlds most innovative mints. This is the ultimate Dr Who 50th Anniversary collectible. The set contains 11 x 1/2 oz. 999 silver coins featuring all of the doctors to date in their various regenerations with a place for the new twelfth doctor. This set comes with a free 50th Anniversary TARDIS it does NOT have the silver 1oz 50th Anniversary coin inside - it is simply the fabulous TARDIS packaging that the coin came in. It does have working sound. The only silver coin you receive will be in the 11 silver coins in the fob set. Each coin features a high quality colour reproduction of Doctors 1-11 in their various regenerations. Behind him is a likeness of his nemesis engraved in 3-dimensional relief. This is surrounded by a finely engraved border design inspired by technology and time travel. 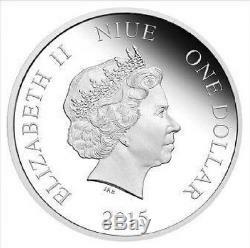 Each coin features the Ian Rank-Broadley effigy of Her Majesty Queen Elizabeth II. 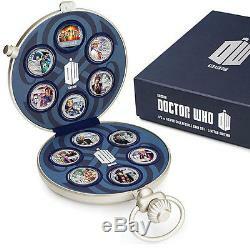 This Limited Edition Doctor Who 1/2 oz Silver Coin Set is presented in a quintessential, silver-coloured fob watch case. The case displays the entire 11 Doctor coin set, with a placeholder included for the 12th Doctor coin (Peter Capaldi). 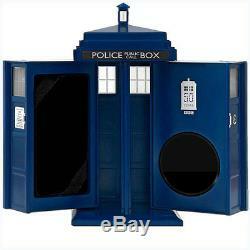 The TARDIS comes with the original pakaging however there is no certificate with the TARDIS as there is no coin inside. The item "DOCTOR WHO 11 DOCTOR FOB SET 11x 1/2oz PROOF SILVER COIN WITH FREE TARDIS" is in sale since Thursday, April 07, 2016. 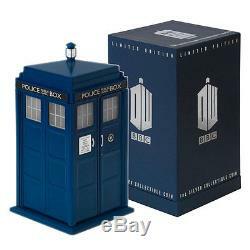 This item is in the category "Collectables\Science Fiction\Doctor Who\Tardis". The seller is "minted-uk" and is located in Eastbourne, East Sussex. This item can be shipped to North, South, or Latin America, to all countries in Europe, to all countries in continental Asia, to Australia.